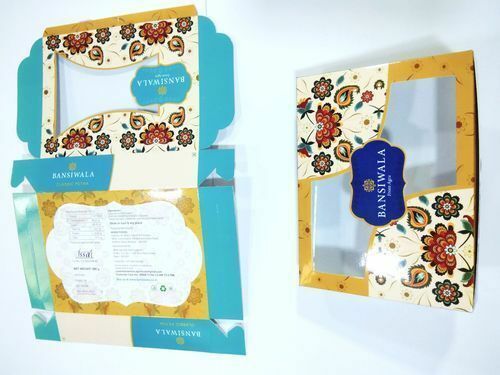 Sweet Box Printing support offered provides for attractive support which makes the whole packaging visually more attractive. Here, our expertise lies in offering printing solutions in single color/multi-color choices in specifications as demanded by the customers. Other than printing, we can also offer embossing, glossy lamination, matt lamination support on box surfaces with any size as demanded from us. Established in the year 2004, at Ahmedabad (Gujarat, India), we, “Shreedhar Printers Pvt. Ltd.”, are a professionally managed organization, engaged in providing a wide range of Printing Services. We also provide Product Catalog Printing, Brochure Printing, Corporate Diary Printing, Book Printing, Brand Promotion Items Printing and Printing Box etc. services with the help of our expertise. The extensive industry experience consistently guides us to meet our varied business requirements and ensuring our product superiority in the global markets. We create cost effective marketing and design solutions without sacrificing the creative process. We keep your budget intact and your project on track. Add to the mix a strong focus on service and creativity. We bring your ideas to life and keep them breathing. Some of our major clients are Pepsi,Vodafone,Airtel,Adani,Reliance Communications,World Health Organization,Idea,Amul ,Reliance,Unicef,Coca Cola,Intas and many more.